The team from Pocket Nurse recently shared a fantastic resource for utilizing simulated medications for vaccination education to nursing students. They acknowledge that while “educating students to administer vaccinations is a regular part of nursing and pharmacy curriculums”, could there be more “strategic ways that [such] teaching methods can be improved?” As healthcare professionals we have all encountered a recent increase in public fear about the outcomes of vaccination, one that should obviously be addressed early and often in a new Nursing student’s education. With the opportunity to role play with standardized patients and perform actual injection skill demonstrations with safe and simulated medications, we can better prepare today’s nursing student for the foreseeable challenges of their career. Arm students with facts: Most parents respond positively to facts, presented to them in a calm and reassuring manner. The Centers for Disease Control and Prevention (CDC) offer several fact sheets and articles explaining the ultimate safety of vaccines. Point your students toward these resources so that they are prepared to share them with future patients and family members. Prep students for unexpected reactions: Although students are likely to be well-versed in the science behind various vaccines, their patients likely will not be and may have valid concerns. It’s crucial that students respond to these concerns with compassion, empathy, and patience, expressing that the ultimate goal of the healthcare provider and the parent is the same – patient safety and well-being. Build trust: Listen carefully to what questions parents are asking, and provide balanced answers. If parents are confused about vaccine safety or side effects, be sure to give them correct information while acknowledging that their feelings of concern are valid. Remind parents that vaccines are safe, they prevent potentially serious diseases, and not vaccinating carries serious risks for their children. Use anecdotes as well as science: Some parents will be reassured by the science that overwhelmingly supports the safety and effectiveness of vaccines. Other parents will want personal stories about why they should vaccinate. Healthcare providers can mention their own experience vaccinating their children, or use anecdotes from the healthcare practice. For example, mention that in the thousands of shots administered, the most serious side effects reported to you have been soreness at the injection site or a mild fever. Don’t take it personally: Parents who express concern about vaccination aren’t trying to challenge or offend you! They truly want to do what is best for their children, and with the overwhelming amount of information available to them, it can be difficult to parse what that is. They are asking you questions because they are depending on you to reassure them, provide the correct information, and keep communications open. Use authority to your advantage: Parents respond better to what is called the presumptive approach, rather than a participatory approach. When it is stated what types of vaccines the child is to receive at a well-child visit, most parents accept immunization. Parents trust in the expertise of their children’s healthcare providers. By utilizing a combination of these supplies brings life-like practice into the classroom without risking mistakes being made on actual patients. After students have practiced their injection skills and mastered all steps to a safe immunization, they can look forward to their clinical rotation with increased confidence and experience. See these Demo Dose products & more in the amazing digital “Simulation and Healthcare Education Catalog” from Pocket Nurse online above. Pocket Nurse is a nurse-owned-and-operated company that specializes in medical education and simulation technology solutions. 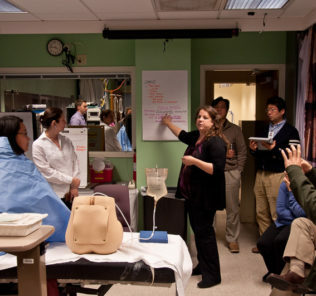 Pocket Nurse fully advocates for and support medical education via their simulation products. Their line of simulated medication, Demo Dose, familiarizes nursing and pharm tech students with medication appearance, dosages, and indicated usages. 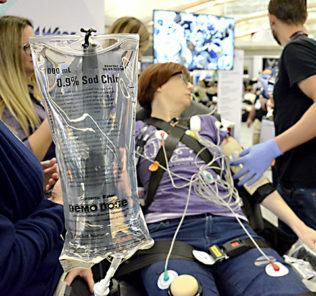 Their manikins and trainers educate EMS personnel, nurses, and allied health professionals such as phlebotomists, by simulating the look and feel of patients. Visit Pocket Nurse’s Website for More About Demo Dose!